Like many other Spurs fans, I’m sure, I’ve had a pretty good day today. It had been far, far too long. As an aside, before I launch into my analysis of the goals, I’d say that Redknapp’s Sun column is worth a read today. It’s good to see Huddlestone get a special mention – I thought he was exceptional in a slightly unfamiliar role on Wednesday evening, but not many seem to have picked up on his performance. He played the holding role, and was so disciplined and clever throughout the game. When Modric and Palacios have played together, they’ve both been here, there and everywhere. With Huddlestone in there, Modric could wander, safe in the knowledge that Tom had his back. Now, I don’t think that Huddlestone is, therefore, a better bet as the more defensive-minded midfield player, but I think that the emphasis has to be on the partnership. If only he could weigh in with a few more goals, I think he would get the chance for England that he probably deserves. Spurs prepare to take a corner – I think we will have fancied our chances from corners, as Almunia isn’t particularly good on crosses, and Arsenal were also missing Gallas and Song. As Almunia scrambles to his feet, he bumps into a defender (possibly Campbell), and this stops him retreating to his line quickly. Rose claims that he was initially going to bring the ball down, but decided to strike it first time at the last minute. His technique is spot on. Will he ever strike a ball better? Almunia simply can’t scramble back quick enough, and it goes in just over his head. I loved Alan Parry’s “WHAAAAT A GOOOOOAL!” commentary! Bale’s goal couldn’t have come at a better time – straight after the restart. A long ball finds Defoe wide on the left. He actually mis-controls it, as it hits his heel and bounces off, which probably does us a favour. Instead of trying to run in behind, he holds the ball up really well. Assou–Ekotto makes an excellent run, which takes some of the emphasis off Bale, who is now looking to move in behind the centre back. Whether Defoe is just feeding this into an area or intentionally looking for Bale is regardless – it’s a tremendous ball. Perfectly weighted for Bale to stroll on to it, safely onside, due to Sagna’s absolute ineptitude. It looks as though he needs to take it round Almunia and finish with his right. But isn’t that a calm finish with his left? Great move, great finish. We could have done without the nervous last five minutes!! Robin van Persie made a huge difference, coming on against some tired legs. Here, he has dropped off, and holds the ball up on the edge of the area. Modric probably isn’t close enough, and Dawson and King should perhaps be a little more aware of Bendtner’s position, as they have left Assou–Ekotto to deal with him. 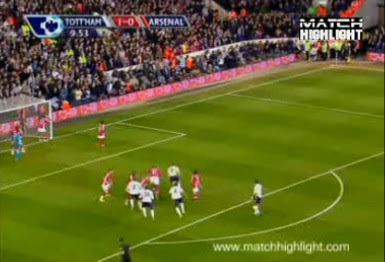 Having said that, Assou–Ekotto could probably have stepped up and played Walcott offside. It’s a nicely-weighted pass for Walcott, who still has quite a bit to do. Bendtner’s in an offside position, but isn’t active. All those bodies back mean that Walcott’s pass has to be inch perfect. In fairness, he gets it absolutely spot on. Bedntner bundles the ball home, and leaves us with a tense finale. However, we needn’t have worried, as a certain someone had, I would imagine, the best twenty minute performance of his life. Exceptional…. Excellent as always Windy. Love the Gomes picture! He was indomitable on Wednesday. Best keeper in the league in my opinion. More of the same from all against Chelski please. I'm really pleased for Gomes after all the stick he took last season.And well done to Harry for employing Tony Parks and then actually listening to his goalkeeping coaches advice. Much appreciated Windy, as always! A great night and a great win for Spurs! Ledley's presence and professionalism was a huge boost for the squad. Hoping he can play against Chelsea tomorrow.